The Adelaide Entertainment Centre (AEC) is an indoor arena located in the South Australian capital of Adelaide, and is used for sporting and entertainment events. It is the principal venue for concerts, events and attractions for audiences between 2,000 and 12,000. It is located on Port Road in the suburb of Hindmarsh, just north of the Adelaide city centre. With modern architecture and acoustics, function rooms and award winning catering, the Adelaide Entertainment Centre provides a live entertainment venue for hundreds of thousands of people each year. 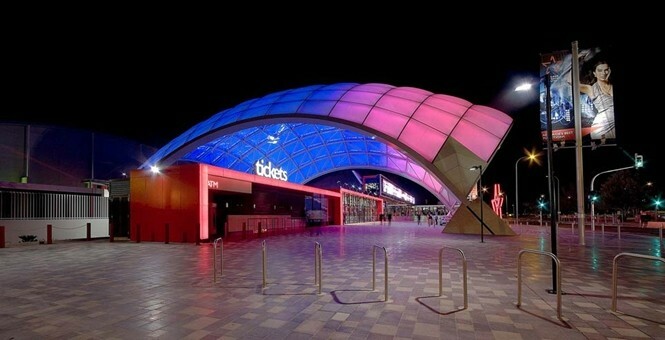 In 2010 the Adelaide Entertainment Centre completed a $52m redevelopment with a new entry and Theatre complex.